The British High Commission: There are mixed views on the indicative value of the three-acre land but some quarters estimate it be as hig h as RM200mil. 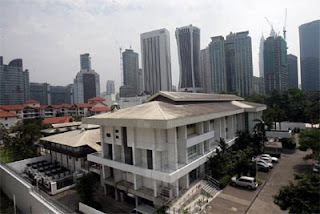 PETALING JAYA: Developers are eyeing the premises of the British High Commission in Jalan Ampang, Kuala Lumpur due to the location and size of the land, property consultants said. However, there were mixed views on the indicative value of the three-acre land which according to sources could be as high as RM200mil. That works out to RM1,525 per sq ft. It will be relocating next year to the just-completed Menara Binjai in Jalan Ampang. SavillsRahim and Co, which is the marketing agent for the property, would be renting on the 27th floor of the 35-storey building. The British was given the current premises in Jalan Ampang as a swap for giving up Carcosa, once the home of Frank Swettenham, the highest ranked British representative to the Malay states. International property consultants VPC group said RM1,500 per sq ft was a fair reflection of the open market value of the property in that location. VPC director and chartered surveyor James Wong said: “Commercial land within the Golden Triangle are much sought after by developers. This is particularly so for those developers who do nott have an existing foothold within the Golden Triangle. “So it is very likely for this land to be tendered and sold at above RM1,500 per sq ft,” Wong said. PPC International Sdn Bhd said the reserved price was conservative considering the locality and land size. “It is very difficult to come across land in such an ideal location in Jalan Ampang and close to the Jalan Ampang-Jalan Tun Razak intersection and the Petronas Twin Towers,” said Siders Sittapalam of PPC International. He said the land would be favourable for an integrated development. Siders drew comparison with other commercial land deals transacted in the city last year. There were three parcels with total acreage of about 27,000sq ft in Jalan Sultan Ismail, Kuala Lumpur which were sold for RM65mil, or RM2,400 per sq ft.
Other land deals included a 28,000 sq ft parcel in Persiaran Stonor, Kuala Lumpur which went for RM50mil (or RM1,770 per sq ft) and a 43,000 sq ft parcel, also in Persiaran Stonor, for RM72mil (RM1,671 per sq ft). A parcel along Jalan Raja Chulan of about 20,000 sq ftwas sold for RM39mil (or RM1,914 per sq ft), Siders said. Another source said the latest transaction occurred late last year when Mulpha International Bhd sold a 32,000 sq ft parcel in Jalan Sultan Ismail, Kuala Lumpur for RM104mil, or RM3,300 psf, a benchmark price for development landin Kuala Lumpur city centre. The single salient feature of this deal was that it was sold with a planning approval.